Urban design is complex but fascinating. At least I find it to be exciting and challenging since urban designers get to shape the lifestyles of the people. I would like to discuss one of the urban design projects I did in Architecture college in a group. We were a group of 12 students, all of us skilled in different areas. When we began, we felt the project work was intimidating and that it was too early for us to be working on one. I am going to be writing a series of articles of how we dealt with this project, the design process that we followed and all the survey methods that we used. It was a great experience. Conservation of the original market character by restricting to various patterns, colours, to create a scenario that invites tourists without disturbing the old and traditional built forms to relate to the original concepts. We are aiming at Sustainability…Sustaining and improving the living standards and reviving the importance of the commercial hub in terms of commercial activity. We listed out the target issues in terms of Sustainable Development. Listing aims of the project is the first and most important thing to do before beginning any kind of project. This gave us a clear understanding of the direction in which we should be progressing. 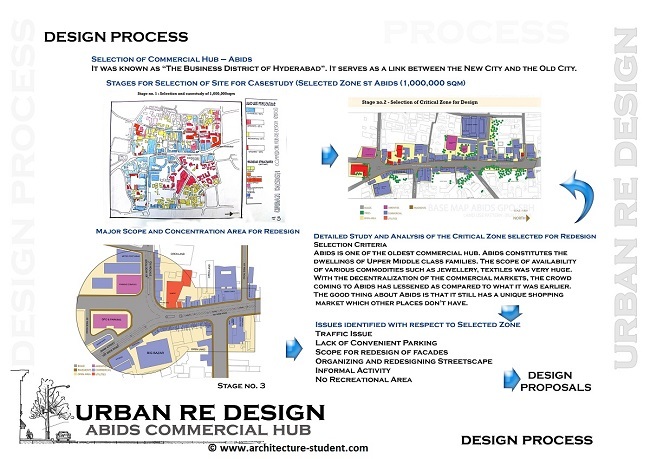 This is the design process we followed for redesigning the commercial hub. We had a brainstorming session with our group and came up with all the possible approaches we could take to design the project. 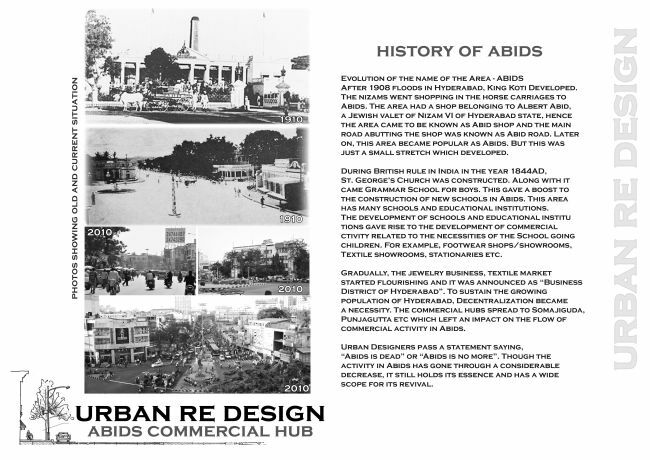 Abids is one of the oldest commercial hub in the Hyderabad city. Abids constitutes the dwellings of Upper middle class families. People from all over the city came to shop jewellery and textiles at Abids. With the decentralisation of the commercial markets, the crowd coming to Abids has lessened as compared to what it was earlier. The good thing about Abids is that it still has a unique shopping market which other places don’t have. This is what we identified as the unique selling point for the regeneration of Abids. To regenerate, it is essential to identify issues and come up with solutions that could enhance the functioning of the commercial hub and help restoring it to its original character.